With God’s protection and guidance, we should be able to conquer fears and live a life full of courage. It is God that commands us to have courage, for having courage means having faith and confidence in Him. Through scripture, we can find the courage God desires us to have. 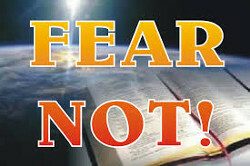 The following is a 31 day list of scriptures concerning “Fear Not”. Thanks for sharing, all the best. Excellent scriptures and thanks for sharing them in your post today.